a division of Guild Laboratories Inc. This thoroughly comprehensive manual does the difficult task of estimating carat weights of mounted gemstones, calculated by their dimensions and shape, with over 300 pages of tables listed and gemstone type. The 434 page resource is an essential asset for jewelry professionals of all kinds and will be referred to often when calculating the carat weight of mounted goods for conducting jewelry appraisals, matching stones for duplicating a jewelry design and countless other applications. 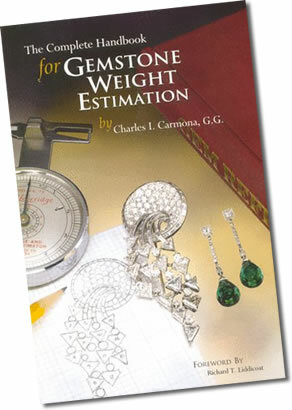 Originally published in 1998, the Handbook for Gemstone Weight Estimation has been reprinted many times to meet with sustained consumer demand. The handbook's organization, and easy to read content have made the book an industry standard. This handbook is available through various book sellers' online outlets. But you may also purchase this guide in volume or request autographed copies directly from Guild Laboratories by Contacting Us. We offer consultation services, and provide experienced expert witness and litigation support to private and governmental agencies. 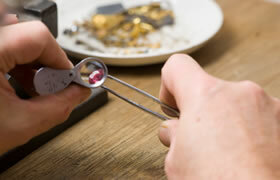 See our SERVICES page to review our complete schedule offered at Guild Laboratories. "I compiled this handbook over decades by weighing gemstones of almost every kind, shape and size. You cannot always un-mount a stone from its setting. But now you don't have to."